When I think of Vegas, I think of fun. Hedonistic pool parties, over-the-top cocktails, dancing till dawn and excessive eating, all in the name of a good time. In most people's minds, Sin City is just that - a place to be bold. What happens in Vegas stays in Vegas. Perhaps that's why friends and family were surprised when I booked a weekend there as part of our honeymoon. People are far more likely to associate the Nevada city with stag or hen parties, or ill-thought-out nuptials. Vegas is also known for its top-class shows, incredible restaurants and once-in-a-lifetime experiences, however - so why wouldn't it make a great stop on our multi-city romantic holiday? My new husband, Joe, and I love eating, drinking and having fun... so a trip to Sin City seemed right up our street. I'll be honest. A major factor in wanting to go was Celine Dion's residency in The Colosseum (below) at Caesars Palace (caesars.com). We planned to start our honeymoon in Napa, California, before flying to Orlando, Florida, so why not schedule a three-night pit stop to see my idol's highly acclaimed show in between? Luckily, Joe agreed. We arrived in Vegas exactly one week after our wedding, batteries slightly recharged after North Cali's wine country. We checked into our suite at The Venetian (venetian.com), one of the classier establishments on the Strip. Twinned with The Palazzo next door, it's an all-suite, Italian-themed enclave complete with shopping mall, food court, casinos, theatre, countless restaurants and several bars, as well as a spa. All the rooms are enormous, the staff courteous and everything you could possibly desire is right there. You needn't set foot outside if you don't want to, but there's so much more to Las Vegas than the casino floor, as we were soon to learn. Our first stop was at In-N-Out Burger (in-n-out.com), a very unromantic joint famous on the West Coast. Las Vegas is its most easterly outpost, so my new husband insisted we go for a double-double, and as I was dragging him to a Celine Dion concert, I complied. We washed it down with a couple of icy ones from Jimmy Buffet's Margaritaville (margaritaville.com) as we walked down the Strip, and then went to get ready for Celine's show. It did not disappoint. I cried so much, the lady next to me handed me a tissue. But they were good tears. Afterwards, we whiled away the hour or so before dinner with some good ol' fashioned gambling. I love the casino at Caesars Palace as it's pretty old-school and traditional. For somewhere pumped full of oxygen, brightly lit and crammed with drinking and smoking gamblers, it's very pleasant. I had a mini-winning streak on the blackjack, so we trotted off to dinner a bit squiffy. We had late dinner reservations at the Vegas branch of my favourite New York restaurant, Beauty & Essex (above right; beautyandessex.com). Its Sin City edition is situated in The Cosmopolitan - one of the latest additions to Las Vegas Boulevard. We underestimated the walk between it and Caesars, and ended up half-jogging, but it was worth it. The food was just as good as it is in New York; we devoured Caesar toast, barbecue fries, ravioli and ragu, all washed down with whiskey cocktails. Next morning, revived by greasy sandwiches from the food court in our hotel, we took an Uber (the most efficient and inexpensive transport in the city) to the Neon Boneyard (neonmuseum.org), spending an hour among the old signage before heading back to stroll through The Wynn. It's another stunning hotel, with a gorgeous lakeside bar and restaurant, whimsical décor and very Instagrammable details. I made a mental note to return. That night, we decided to check out everything our own hotel had to offer. First up, pre-dinner cocktails at The Dorsey on The Venetian's casino floor. Next, another show, this time Baz. Based on the movies of auteur director Baz Luhrmann, it's a cabaret show/musical hybrid that includes scenes from Moulin Rouge!, Romeo + Juliet and The Great Gatsby - many of the tables are on the stage or the runways leading off it, so the actors and dancers perform around you. If you want your drink refreshed, you press a little light on your table and a waiter visits when it's safe. Very enjoyable! That night's feast was at Yardbird, one of the more casual restaurants at The Venetian, but still with tip-top service and delicious Southern-inspired food (when they heard we were newlyweds, they brought out a very impressive dessert complete with sparkler). More gambling ensued, this time less successfully, although I did learn to play Spanish 21 - a game in which there are no 10s (just say "hit me" and hope for the best). Cocktail waitresses bring free drinks as you spend... many a person's downfall. Slightly delicate the next day, we made our way to Lago at the Bellagio (bellagio.com) for lunch and hair of the dog. Italian tapas is its thing: small sharing plates of pizza and pasta. Carbs, cheese, a seat outdoors on a lovely terrace and an Aperol spritz (or two) were just what we needed before chilling out on The Venetian's pool deck. Our last dinner was at Mandalay Bay's Aureole (mandalaybay.com), a semi-fine dining experience with a heavy wine angle. The restaurant looked a bit chain-hotel to me, but there's a four-storey wine tower that a 'wine angel' travels up and down on a wire to fetch the bottle of your choice. Gimmicky, but fun. We left Las Vegas a little depleted, but not as much as expected. Nightclubs and all-out hedonism were avoided, but there was so much to see, do and eat, they didn't even factor. It might not be a traditional honeymoon destination, but Vegas definitely has a classy, romantic, softer side. Flats are essential for walking between resorts (quite a distance). A cross-body bag is good for women, freeing up hands for cocktails and casinos while avoiding pickpockets. Bring lots of light layers - it can be hot outside, but hotels are heavily air-conditioned to keep gamblers perky! There are no direct flights from Ireland, but you can go via London or through another major American city — Aer Lingus offers direct flights to LA (aerlingus.com), for example. Download the Uber app: you’ll use it religiously (resorts have separate entrances for Ubers and car-share rides). See also visitlasvegas.com. 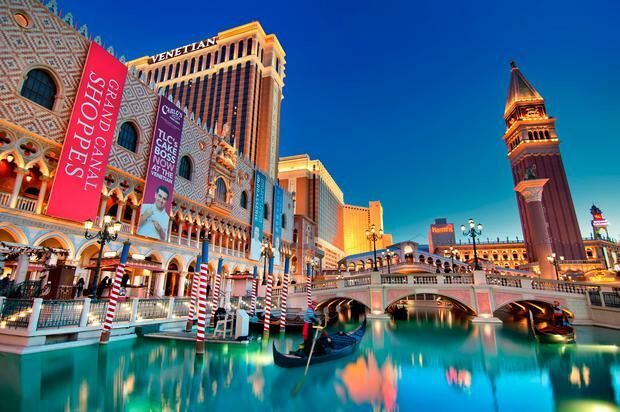 The all-suite Venetian (venetian.com) is gorgeous, complete with gondola rides and a good location on the Strip. Suites start from $259/€220, plus a $39/€33 resort fee (there’s a 15pc discount if you book direct). I’d also recommend The Cosmopolitan (cosmopolitanlasvegas.com).